I don't give much credit to those US$ doom scenario, what currency will investor buy when they drop the US$? euro? yen, GBP or AU$? but are these much better and safer then the US$? certainly not. the only way I can see a US$ collapse is against gold or other commodity or even against goods and phisical assets (inflation and total FIAT collapse like in Wulfgar vision...). Maybe CNY once they decouple from the US$? Even if a collapse is unlikely, I can't see how the US can meet their obligations without further debt monetisation. I think institutions will be reluctant to buy or hold US$ denominated instruments when there is a strong risk of long term currency decline. We can see from the GFC that governments and reserve banks will go to extraordinary lengths to curtail and contain financial shocks. It therefore seems unlikely that there will be "sudden collapses" in the future (although the roller coaster ride of the AU$ in the last two years were amazing to watch). A likely scenario, in my opinion, is that there will be a long period of economic stagnation in the US (and possibly Europe) in nominal terms, with a possible slow deterioration in real terms per capita. Good to see you back Anders. Thank you Tinpusher (and Staringclown)! It's good to be back. EUR and AUD taking a bath this morning againt USD. -0.01 (whole cent) for both in 2 hours. So, how much is the AU$ linked to the fortunes of the EUR? It's an acronym for a group of four countries. Portugal, Ireland, Greece and Spain. They've got one thing in common - they're all in deep economic trouble. And they're all in the eurozone. These are the four countries reckoned to be suffering most grievously from having to stick with the euro - and with the European Central Bank's interest rate policy. To give you flavour, it seems that Ireland's economy could contract 4% this year. I think it will be quite a while before the USA will have to worrie about buyers af their debt, japan is in a worse situation with a much higher public debt of around 200% of gdp a lower credit rating and because of deflation and its citizen not spending they have no problem to find gov debt buyer, USA will face the same thing with their citizen saving sinking into buying US gov debt in a Japan style circle. I'll agree in a long period of stagnation or lower growth/high unemployment, the end of trouble would be with a high enough productivity levels or some tech breakthrough like cheap energy source. AUD Gapped up this morning!! Am looking for a tech pullback to fill the gap and take a breather. 0.91 ish before up we go (well down the USD goes) again. 6 cents (AUD) in 12 trading days is great for Longs but too quick. Well the pullback to 0.907 was last night pre American open and we are now at 0.913. Jesse has some long term dollar charts which I nicked. 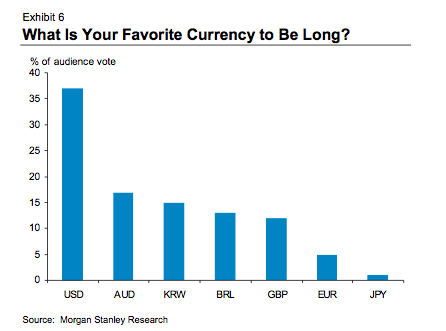 Here is the longer term view of the US Dollar as measured by a basket of currencies. Can it 'break out' here? Yes, certainly. Europe and Japan have their problems, and in the world of fiat, the grading of the paper is done 'on a curve.' The central banks and their mavens, who intervene at least indirectly in the currency markets with a certain obsessiveness these days of non-stop financial engineering, like to shove their manipulation around the plate as well. They don't 'tweak' the economy; they are the economy, at least at the margins. Can it also fail and break down here? Yes, certainly. A stronger dollar will step hard on the weak US economic recovery. It will serve to lower import prices, but dampen exports, which is what they call 'bad news' when your domestic demand is slack. There is the fundamental detail an enormous amount of dollars being held overseas that are not in circulation so to speak. At some point they, like the swallows of Capistrano, will return, and have trouble finding a place to comfortably roost. But the market does not care about our theories, or even the charts. They are just rough estimates of a very complex reality. This is a disclosure that all pundits should place on their prognostications. And in these days of thin markets and bank prop desks as a major source the income, the fundamentals are less relevant than the short term reality of the squid's need to feed. Let's see what happens. Then we will know something actionable. Quite the battle going at 0.91 on the Aussie, its also the 0.382 Fib No from its recent rally from 0.87 to 0.93. Too right, there is a battle at 1.40. The German and French PMIs came in quite favourably this evening. The [biggest] problem is Greece. it is quite fascinating to watch the euro, I think it is much more powerful and effecting markets then most trader think, look at it today and in the last 2 months: euro is going down and bring down pretty much everything with it. Even the power of gold goes down together with the euro, as in the last 2 months gold moved only at max around 5% when priced in euro. Our $ is struggling against the $US. Looks like support is at 87c and resistance at 94c. IMO, the $US index looks more inclined to rise further. A pair of surveys from Morgan Stanley analysts Tim Davis and Emma Lawon serve to highlight how strongly things have reversed from last year, when everyone had nothing but bad things to say about the good ol' Greenback. They should be pretty self-explanatory. 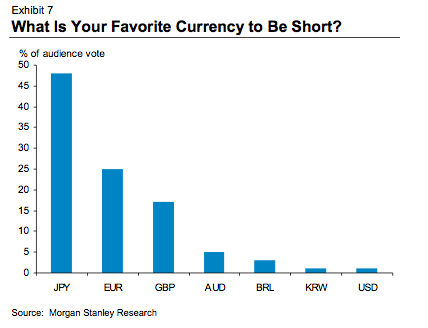 The USD is neither a good currency to be short or long in the coming years. It is not "good", it is "bad". Avoid like the plague. All FX is 'set' against the USD. Its the Fiat bullsh*t.
If I long the GBPAUD, I am in effect long the GBPUSD and in turn short the AUDUSD. For intraday traders the 15Min GBPYEN cross (aka THE DRAGON) is giving some good 100pip short term trades. DYOR. I have been trading the GBPYen as well on a longer time frame chart, I am holding a short at around 147.6 for several days (might even weeks), I had a limit at 143.6 and just missed by few pips (rise now the limit to 143.92), i'll probably add more at around 148.8. If I wouldn't have any position I'll short it now at present (around 147.2). Any comments on the 1+ cent drop in the AUD/USD last night? I made a large purchase through Amazon a few days ago so I hope the payment has already been processed! A drop below 0.8750 and all hell could break lose. It is almost like Australia perfects the habit of being a late arrival on anything. An across the board flock back to the USD (and more so the YEN) as Mr Dow heads south. The DXY is currently in an inverse correlation to the SP/Dow. I am still trying to get my head around the Yen strength, apart from carry trade covering. However, I thought most of the covering took place during Q4 2008.
Who or what is persistently buying Yen? Or not selling Yen? I don't understand the fundamental flight to Yen either in uncertain times. If anyone can explain it please share. Japan will be the first country out of the GFC because it has been in the GFC for the longest time. The GFC is a demographics driven event that started decades ago.